This field trip was to the Acres Down and Beaulieu Road Station areas of the New Forest on 21st May. Seven members turned up at Acres Down for this Hampshire trip on a clear and sunny day. Unfortunately for most of the group the highlight of the day, a male Honey Buzzard, first appeared from the Raptor Point at 9.20am and was gone by the time of the official start of 9.30am. Those that were fortunate to see it were thrilled that it flew directly overhead giving magnificent views of the bird. 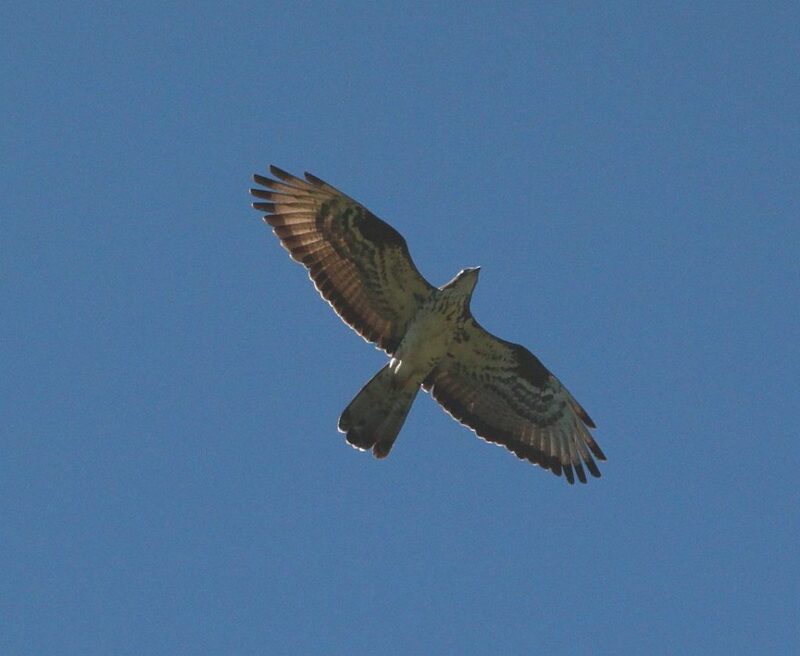 Unfortuntaely this photo of a Honey Buzzard was not taken during the field trip! A pair of Stonechats were displaying on top of the gorse bushes on the walk to the Raptor Point from where the trip was based. Buzzards were the next raptors to be seen and it was not long before the male Goshawk was seen perching on his usual tree opposite the viewing point. He was later seen circling high in the sky before disappearing in the clouds. After an excellent cream tea the short trip to Beaulieu was made in the hope of seeing some woodland species. After walking round most of the woods at Shatterford a male Redstart made a brief appearance on a branch before disappearing in the undergrowth. Upon leaving the woods a juvenile Sparrowhawk went through the trees at the edge of the wood. Although the total number of species seen was quite low there were some excellent birds during the foreshortened trip.